24 black-owned breweries. 45 collaboration brews. 20 food vendors. 6 musical acts. 3 DJs. Cheers to Fresh Fest 2019. Jan. 14, 2019, 5:30 a.m.
Fresh Fest, the nation’s first — and only — black beer festival, which debuted in Pittsburgh last summer, is coming back this year, and it promises to be bigger, broader, and fresher. Expect 24 black-owned breweries, 45 collaboration brews, 20 food vendors, six musical acts, and three DJs — and likely more to come. “We are doubling up with the amount of brewers and the amount of collaborations that we’re doing and vendors,” said Fresh Fest Co-Founder Mike Potter, who is also the founder and CEO of Black Brew Culture, an online magazine. Fresh Fest will expand into a three-day affair — Aug. 9-11 — with industry-focused activities on Friday and Sunday, such as a symposium on diversity, an industry bottle share, and a brewer’s appreciation brunch. Mark your calendar for the main, public event on Saturday, Aug. 10. In the first year, attendees packed into the outdoor plaza of Nova Place in Allegheny Center on a warm summer evening for the one-day event. This year, Fresh Fest will expand to the indoor portion of Nova Place, as well. Organizers also anticipate that attendance will double. More than 1,200 people attended in 2018, as the event drew national attention from outlets like NPR, Thrilist, Blavity, and City Lab, along with plenty of local coverage. 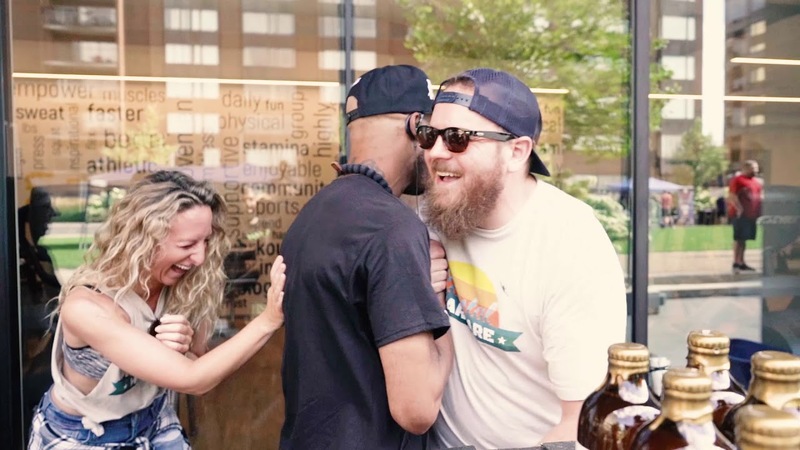 Plus, it was a chance for Pittsburghers to try the beer from the black-owned breweries they’ve heard about, and this year will offer even more opportunities to do just that. Black-owned breweries from as far away as California, Maryland, New Jersey, North Carolina, and Texas — and as nearby as Philadelphia and Harrisburg — will attend. Also look for Louisiana’s Cajun Fire Brewing Company and New York’s Harlem Brewing Company, for example (full list below). While there’s not a single black-owned brewery in Pittsburgh, brewers here will partner with with black artists, entrepreneurs and small business owners to collaborate on a beer. Though the list hasn’t been finalized, local spots Brew Gentlemen, Dancing Gnome Brewery, East End Brewing Co., Four Points Brewing, and Hitchhiker Brewing Co. are on the list to collaborate. Some breweries even kept their collaboration beers on tap after last year’s Fresh Fest. A VIP session on Saturday afternoon will include a live-taping of the Drinking Partners podcast with Brooklyn-based author and brewer Garrett Oliver. The taping brings Fresh Fest full circle, considering it got its start through Drinking Partners when Potter appeared on the show, which is hosted by comedians Day Bracey and Ed Bailey (both Incline Who’s Next honorees). Day Bracey, Mike Potter, and Ed Bailey. The craft beer industry remains dominated by white men. In the U.S., minority-owned craft breweries and brewers make up less than 2 percent of the industry, according to Fresh Fest organizers. “When we go to breweries, we look around, and it’s like, ‘Man, there’s not a whole lot of us here,'” Fresh Fest Co-Founder Bracey told The Incline last year. For Pittsburghers, the event offers a chance to try some new beers and have some fun. But for brewers who travel across the country, the festival has a deeper meaning. And Pittsburgh has become the epicenter for this kind of collaboration. “We can do it,” Potter said. Potter and Bracey plan to continue hosting Fresh Fest annually — and maybe even twice annually, once in the summer and once in the winter. For right now, they’re focusing on this summer. Applications for vendors, brewers, musicians, artists, and food providers can be found here. Brew and Feed – Mooresville, N.C.
Cajun Fire Brewing Company – New Orleans, La. Daleview Biscuits and Beer – New York, N.Y.
Four City Brewing Company – Orange, N.J.
Harlem Brewing Company – Harlem, N.Y.
Harris Family Brewing – Harrisburg, Pa.
Island to Island Brewery – Brooklyn, N.Y.
Khonso Brewing Company – Atlanta, Ga.
Montclair Brewery – Montclair, N.J.
Patuxent Brewing Company – Waldorf, Md. Raindrop Rum – Springfield, Mass. Rams & Parrots – Baltimore, Md. Rhythm Brewing Company – New Haven, Conn.
Spaceway Brewery – Rocky Mount, N.C.
Thunderhawk Alements – San Diego, Ca. Union Craft Brewing – Baltimore, Md. White Lion Brewing Company – Springfield, Mass. Updated: This article was updated to add the list of brewers attending Fresh Fest.